The governments of Colombia and the United States renewed their verbal attack on Russia’s dispatch of two military planes to Venezuela a month after US Air Force planes landed in Colombia. The war of words over the presence of foreign military aircraft in the neighboring countries is the latest exchange in the dispute over the US effort, with Colombian support, to force out Venezuelan President Nicolas Maduro. “Russia has to get out” of Venezuela, President Donald Trump told reporters Wednesday during a meeting at the White House with Fabiana Rosales, the wife of the US-backed opposition leader Juan Guaido. The Russian flights are a military intrusion, said Colombian Foreign Minister Carlos Holmes Trujillo, according to W Radio. The two Russian aircraft arrived in Caracas on Saturday. One plane was seen off-loading soldiers and the other unknown kinds of supplies. One of the planes left two days later. The fact that the planes landed at Caracas’ civilian international airport during daylight was taken by various observers as a sign that the Russians and Venezuelans wanted their arrival to be noticed. “Such flights ordinarily would be sent to a protected military air base beyond the sight of the public,” said the New York Times. 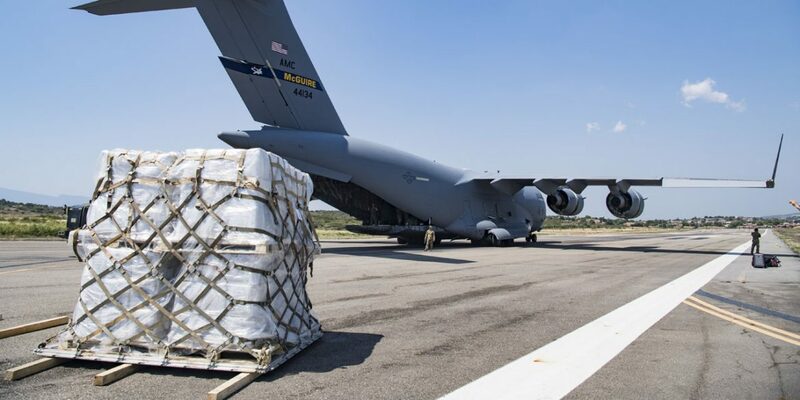 In similar fashion, the US made sure that the arrival of three Air Force cargo planes in Cucuta, Colombia in February was well-publicized. The US said they contained relief supplies for Venezuela. Cucuta is on the border between the two countries. In recent decades, there has been extensive military cooperation between Colombia and the US. In 2008, the countries signed an agreement allowing the US to set up seven military bases in Colombia. That deal fell apart in 2010 when it was forbidden by Colombia’s Constitutional Court. But the countries continue to have close military ties. Colombia is the US’ strongest ally in Latin America and its military forces have been equipped, trained and given intelligence by the US military. Top military leaders from both countries have met in recent weeks to discuss regional security issues. In February, the head of the US Southern Command (Southcom), which handles all US military activities in Latin America, hosted the Commanding General of the Colombian Military Forces at Southcom headquarters in Miami. In mid-March, Southcom’s Deputy Commander traveled to Bogota to meet with a number of Colombian military leaders, including the Commanding General as well as the commander of Colombia’s Special Forces Division, according to a Southcom release. In addition, Southcom ran a training program during March at Colombia’s main military training center in Tolemaida. The program was designed to improve the leadership capabilities of Colombian non-commissioned officers, and the US instructors were “former sergeants major who were part of special operations,” said Brig. Gen. Fernando L. Losada Montoya, Chief of Education for the Colombian Air Force, according to Southcom.